We help you achieve happiness through creating order. Our corporate shelving solutions solves a variety of business shelving needs. 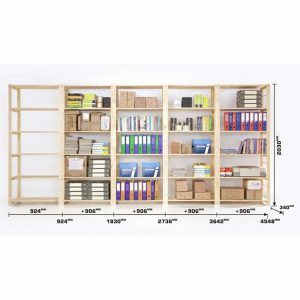 Our focus is on archive and filing stores and all other store room shelving applications. In the hospitality industry our expertise lies in linnen and wine storage. Our systems are also suited for shopfitting and well worth investigating as an alternative to costly traditional shopfitting. Call us for a free consultation. 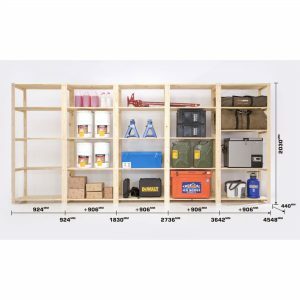 Shelf Space is the leaders in cost effective garage shelving. Our custom shelving solutions combined with our unique hook and rail systems turns any garage into an unbelievably organised space. Beyond the garage we also offer solutions for pantry shelving and walk in closet shelving and hanging space. Our home office solutions offer an affordable yet functional solution and can also be used in kids rooms. Our current promotion: With our bundled garage makeover deal, aimed at the home market. The aim is to create a practical bundle that will solve the needs of most. 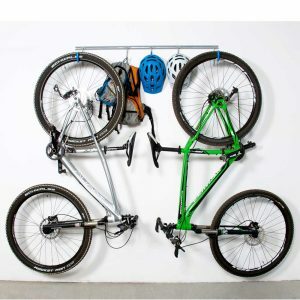 It includes 3.6m shelving plus 10 hooks and 2 rails and is a must for any untidy garage. 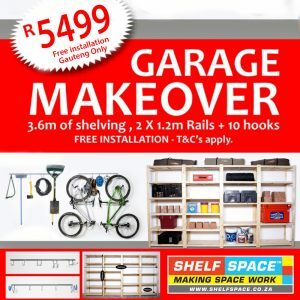 If DIY is your thing, come save 15% at our JHB factory store, or order shelving online. We ship country wide and the ‘Garage Makeover’ is an item in the online store list. Watch the video below to see how we combine our hook and rail system with our shelving to transform this untidy garage! We have made a difference by transforming untidy spaces with our shelving and hook and rail systems, both at home and in the corporate world. We can do the same for you! We believe the success of our business consists of a combination of high quality products and fast, professional and friendly service. Our shelving is durable and made from 20mm solid pine wood, it will be the only shelves you ever need. Our strong adjustable shelves will accommodate most items you want to store on your shelves and one shelf unit can carry a total weight of 100Kg! Baie dankie vir die installasie. Johannes en Lucky was ongelooflik professioneel en het die hele ervaring n plesier gemaak. Hulle weet presies wat hulle doen en kan die rakke sekerlik toe oe installeer. Ek het jul dienste aan n pel voorgestel en sal aanhou om so te doen. Thank you so much for the shelving installed! Its excellent, and we love it. Your team were great, efficient and everything was just done so tidy. I will be sending a recommendation on Facebook for you guys! Just popped around the house and checked the shelves. Looks great! I was impressed by how you got around the electricity box, most people would not even have tried to put the shelfs around it. And I was expecting dust all over the place from the installation but the garage was almost cleaner than what I left it. Thanks for all your efforts in getting the shipment to me on time! I put up the shelving and racks on Saturday and it looks great and works perfectly. I will send some pictures. Vreeslik BAIE dankie en ek sien regtig baie uit na my nuwe garage se make over! My vrou is vreeslik baie happy! Jy weet wat hulle sê, happy wife, happy life! Dankie vir die besigheid, sal julle definitief bemark en aanbeveel aan almal! Your guys are done and I’m very impressed once again and it’s been a pleasure doing business with you. Johannes and his team were very professional! Your guys (Johannes and Klaas) have just finished the job at my house. They are fantastic – helpful, courteous, professional- and a real credit to your organisation. Thanks again, you have a great product! Thank you so much for organizing the delivery. I really love the product. It makes things look very neat! Thank you for the excellent service! Thanks for the professional service! 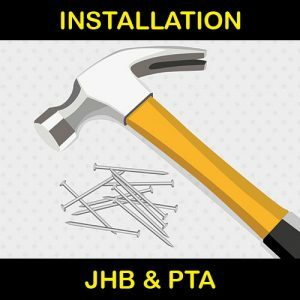 The installers were a pleasure to work with. Click on the bouncy icon below to get the contact details and trading hours for a Shelf Space store near you!